Hastings Priory’s cricketers were beaten at home to Eastbourne in the Gray-Nicolls Sussex T20 Cup. Sussex Cricket League Division Two side Priory went down by 43 runs in their first round tie against Premier League neighbours Eastbourne on Saturday. Having won the toss and chosen to bat at an overcast and chilly Horntye Park, Eastbourne recovered from 51-4 after the seventh over to post a very challenging 175-6. 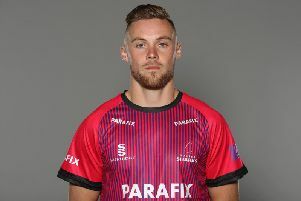 Henry Smith claimed the early wicket of Eastbourne captain Mark Tomsett before Jed O’Brien, who returned fine figures of 2-17 off four overs, bowled Dominic Shepherd for 19 off 13 balls. Sam Hobbs (2-32 off three), who was playing for Priory’s under-14 team last season, celebrated his first team debut by dismissing Luke Tomsett and Luke Gallichan to leave the home side handily placed. A partnership of 105, however, between Callum Jackson and Chris Borsoi swung the game in Eastbourne’s favour. Sussex professional Jackson was eventually stumped by Jake Woolley off Priory captain-for-the-day Elliot Hooper for 62 off 53 balls, while Borsoi ended 54 not out off just 31 balls. O’Brien picked up Priory’s final wicket, dismissing Matt Cooke caught and bowled. Priory needed to get off to a fast start in reply if they were to stand a chance of reaching the target, and left-handed openers O’Brien and Hooper ensured they did just that. Runs were flowing freely until Hooper was brilliantly stumped by Jackson off a Sam Hart wide for 29 off 23 balls. The tall figure of Hart then bowled Jack Colley for a third ball duck in the same over. Eastbourne were in command thereafter, particularly once Hart (3-26 off four) bowled Harry Finch for 10. Finch was fresh off playing for Sussex in their County Championship match away to Durham last week. Mark Tomsett (2-21 off four) dismissed Woolley and Joe Lamb for five between them to turn the screw, but the game did at least end on something of a high note for Priory. O’Brien completed a very good individual performance with an unbeaten 50 off 48 balls and Alex Coyle - another young first team debutant who played for Priory’s under-16 team last summer - was 16 not out as Priory finished up on 132-5.